An exclusive collection of specialty merchandise to celebrate excellence, available only to The American Prize winners, runners-up, finalists, semi and quarter finalists of all competitions, (including conductors and administrators, board and ensemble members, colleagues, friends and family.) Featuring personally engraved The American Prize Certificate Frames, plus Signature Batons, Embroidered Polos, Lapel & Dress Pins, Music Totes, Tees, Latte Mugs and more. 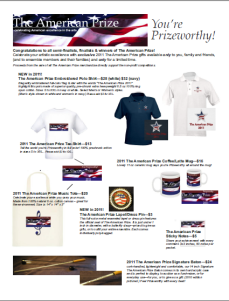 Proceeds from the sale of all The American Prize gifts directly support the non-profit competitions. Download 2-page catalog and order form here. If you believe that the arts are the soul of a great nation; if you believe that great art is being made all over this country—not only by professionals and not only in our major cities—but also in communities large and small, by students, civic groups and faith-based ensembles; if you believe America’s artists deserve reward and recognition, please give to support Hat City Music Theater, Inc., the non-profit 501(c)3 organization which administers The American Prize. Your donation to HCMT/The American Prize is tax deductible to the fullest extent allowed by law and will be used solely to fund financial awards. Gifts received through this website are not used for administrative purposes. You may designate your gift to help fund prizes in honor of Maestro Vytautas Marijosius, or Friedrich and Virginia Schorr, or you may choose to specify the competition prize you wish to help fund, or you can give to the general prize fund for The American Prize. Simply email your instructions on our secure PayPal donation page. Visit our non-profit eBay site, EconomyClassical, which has many unique performing arts gifts and supplies. Your purchase helps support Hat City Music Theater, Inc. and The American Prize.